Novatel Wireless was showing off their latest toy, the MiFi2 cellular hotspot at MWC and it has a lot of goodies. 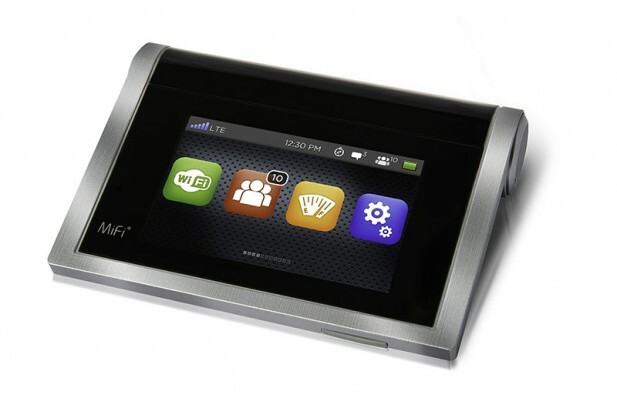 If you are familiar with the older MiFi, that is the starting point for V2. The idea is easy enough to grasp, take a 3G/4G data modem and a WiFi radio, wire them together, and put a battery in the box. Done. Given that it is just a pipe between two wireless radios, other than supporting new radios, how do you make V2 better? How about adding a touch screen, microSD card, GPS, and a bunch of other features aimed at file sharing among connected users. Instead of adding to or subtracting from the core functions, it adds tangential features you may or may not care about, but can be 100% ignored if you don’t care. The physical shape is reminiscent of recent Apple external trackpads, a flat metal plate with a cylinder on the edge to house the cylindrical battery. This styling move makes a lot of sense because to get the claimed 11 hour battery life, the MiFi2 has a big cylindrical 2900mAh battery in the big cylindrical Apple-esque styling feature. If the screen isn’t in constant use the device should be capable of an all day surfing session with relative ease. Some of the features that were added are quite useful like having a white list and a black list for connecting devices, not just one or the other. It will also show you a list of who is connected as text, significantly more useful than the MiFi1’s blinking the names as ASCII (or EBDIC if you had the European firmware) on the sole external LED. That got tiresome after a few letters. Just kidding about the EBDIC bit. And the rest of the blinking stuff, the MiFi1 had nothing useful on the case other than a power LED. One feature that is quite useful is the GPS on the device. Most phones have that now so it isn’t a killer feature, but Novatel Wireless did add one very nice bit called GPS over WiFi. This is just what it sounds like, you download the driver from their site and then it will beam the location directly to the device. To make matters better, they have drivers for Linux, Mac, and toy OSes so it is actually a usable feature. Finding programs that are GPS aware on a PC is more of a trick though but that is changing mainly through the web and Firefox. Slightly less useful mainly because it it ubiquitous is the file sharing bit. There is a microSD slot that is shared among all users connected with a web interface to upload and download files. Handy but not a killer app by any means. Similarly it can stream movies to any DLNA capable device so playing media from it should be quite easy if they didn’t totally botch the UI. More questionable is the last one, SMS. Any 3G or 4G modem has to have a SIM, or at least be on a cell network to function. That means it has a phone number and in theory can make and receive phone calls or SMSs. The problem is that the MiFi2 can get an SMS but it can’t actually send one so if you get one, you need to respond on another device like your phone. If you have that on you to respond, well, you would probably be better off using it instead of the MiFi2 to get the message. Updated March 4, 2013@5:30pm: Changed Novatel to Novatel Wireless. Updated March 5, 2013@11:15am: Changed pricing to reflect contract and non-contract prices.